Serious riders want serious comfort. That's why we created the Super Headrest. Our headrest is adjustable and functions as an additional support for your shoulders, neck, and head. Does your UT Super Headrest Clamp need to be replaced? Order one up and get back to riding your trike comfortably. Sometimes your headrest will just get a little worn out after all that triking. Getting a replacement is quick and easy. 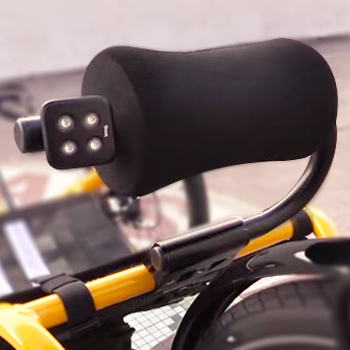 We are incredibly proud of our Utah Trikes custom headrest. We use it often with our custom mesh seats and on catrike models. The double hinge makes positioning a breeze. We designed it so that it could be a head or a neck rest depending on personal preference. You won't regret adding it to your trike. Additionally, the headrest can be used as a mount for a tail light to keep you safe and visible when you're riding at night. The height of the mount makes you even more visible to traffic. "It looks like a nice comfort feature." "Its a great idea, and one that would be a nice addition on a leisurely ride." "Better support for fat head"